Projected diameter of individual lenses 0.2"
The overall design of the IFU is shown below. The IFU is stored in one of the three mask cassette slots and it is inserted into the beam as if it were a slit mask. Two pick-off mirrors direct light from the focal plane through fore-optics in the enlarger body and onto the lenslet arrays. Fibers then reformat the focal plane into two pseudo-slits that pass the light into the rest of the spectrograph. Either of these slits can be masked off in order to get more wavelength coverage but half the field-of-view ("one-slit" mode). The GMOS-S IFU also includes masks for allowing use of Nod & Shuffle. The figure below shows the relative positions of the IFU fields and the pseudo-slits in the focal plane. The slits are separated by 175mm. In two-slit mode the long axis of the 'Object' lenslet array is aligned with the dispersion axis of the spectrograph (along the x-axis of the CCDs). The lenslets are hexagonal in shape and are laid out in rows of 25 lenslets each. Pairs of rows are grouped into "slit blocks" of 50 fibers at the pseudo-slits. The nomenclature for the slit blocks, their locations in the IFU fields, and their mapping onto the detector are illustrated below. Note that the 'sky' lenslets (letters coded purple) are interleaved with the 'object' lenslets (numbers coded green). 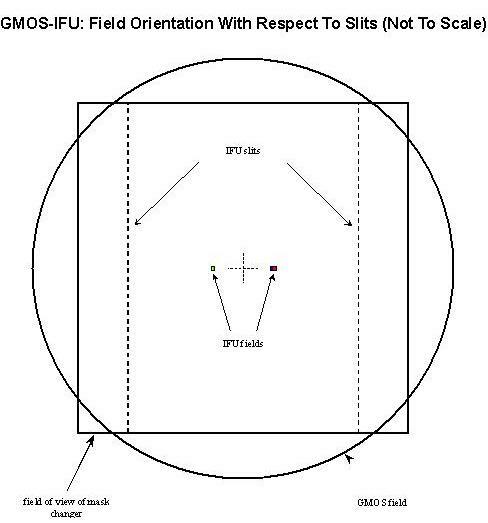 The right-most halves of the fields on the sky (IFU Right Slit in the OT) are fed to the pseudo-slit marked Red on the IFU itself. These spectra fall on the left (red wavelength) side of the CCD mosaic. Conversely, the left halves of the fields (IFU Left Slit in the OT) end up in the Blue pseudo-slit and fall on the right (blue wavelength) side of the CCD mosaic.